The event will be held in 1300 and 1400 Crittenden Ln (CL3 and CL4 on the map). The welcome and planning session will be in the building CL3. There is ample parking, including accessible parking, right next to the entrance. Please park to the south of buildings. 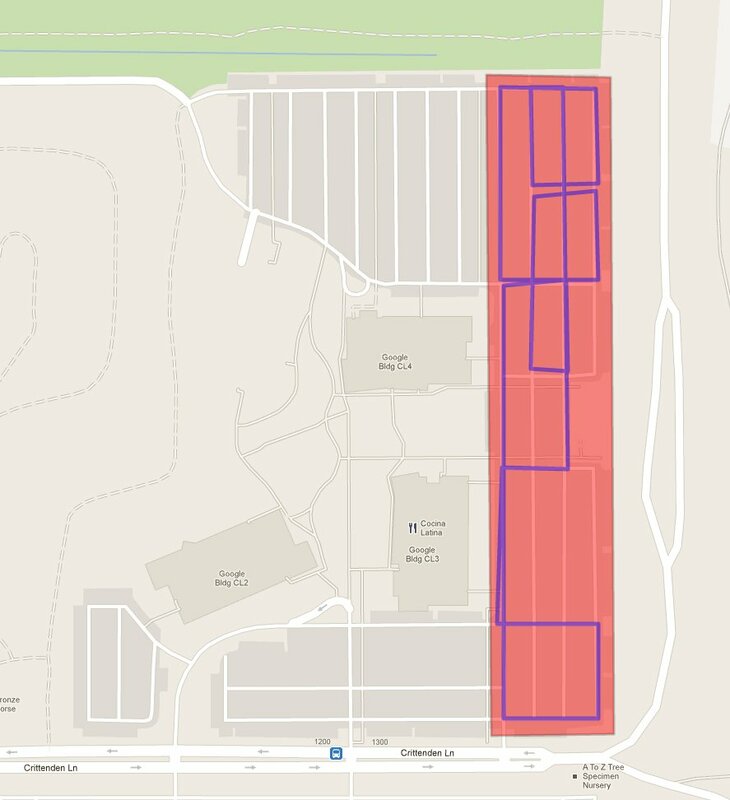 Please note that the parking lots to the east of the buildings will not be available to us on Saturday. Instead, please park in the lot south of building CL3, which does include accessible parking spaces. If that lot fills up, the extra lot to the north of CL4 is also available. Unfortunately, the Caltrain Shuttle into Google does not run on the weekends. We highly recommend that participants use this page to organize carpools and room shares. We are looking into arranging limited transportation from the Caltrain station — let us know on this page if you need a ride. See this page for lodging information. Anyone need a ride from Alameda? I’d be willing to either drive or pay someone else for gas. I have arranged to couchsurf with someone for the duration of the event, but if someone has a room reserved at a nearby hotel (the Hampton is all booked up) and would like to share, please do let me know. Thanks for the Bridge School heads up. That’s how we roll at THATCamp Bay Area… we lined up Neil Young, Arcade Fire, Dave Matthews, Foo Fighters (on Sunday), Eddie Vedder and the like within about 300 yards of THATCamp this year. The show starts at 5pm on Saturday and 2pm on Sunday. Guess that explains why the hotels may be hard to come by. I’ll be driving from Oakland. If anyone would like to carpool from the East Bay, I’ve got three empty seats. @cziogas: maybe we can connect? Hey! If anyone needs a ride both days from San Francisco, I will be driving to and from. 3-4 extra seats. I’m at a loss for housing. My plan is to fly into SFO and not rent a car. Email me if you have any housing leads, etc. @Anne Trubek, you can take BART from SFO to several other parts of the Bay Area and maybe carpool from there. It opens up a lot of housing options without having to rent a car. If anyone needs a ride from the Mountain View Caltrain station, or from the Sunnyvale/Mountain View/Palo Alto area, I’m happy to give a lift. I live in Fremont. Do you still have space in your car? Please email me at ude.d1555924419rofna1555924419ts@3n1555924419ahcp1555924419. Oh, popular Jessica Beard! If you have room in your San Francisco car – I would appreciate a ride. cmoretta(at)sfpl.org Thanks! Hi – I am in Oakland & can drive. If you need a ride, send me an email: gro.h15559244196e@hg1555924419e1555924419. If I don’t get any responses, I won’t be driving, so let me know! Thanks. I’m staying at the Marriott at El Camino & S. Bernardo and would love a ride if you happen to be going that way. I’m at moc.l1555924419iamg@1555924419regdi1555924419rbs1555924419. @Aditi Muralidharan- I need a ride to the Grand Hotel on El Camino Saturday night and from the hotel on Sunday if you have room. sasheu(at)utexas.edu. Looks like the seats in my car are full. See you all in Mountain View on Saturday. Sorry for the late notice — I can drive people back to Oakland/Berkeley on Sunday. Email me at ddt at ischool.berkeley.edu or find me at camp!